Volvo Cars' XC90 has been awarded the Top Safety Pick+ rating from the American Insurance Institute for Highway Safety (IIHS). 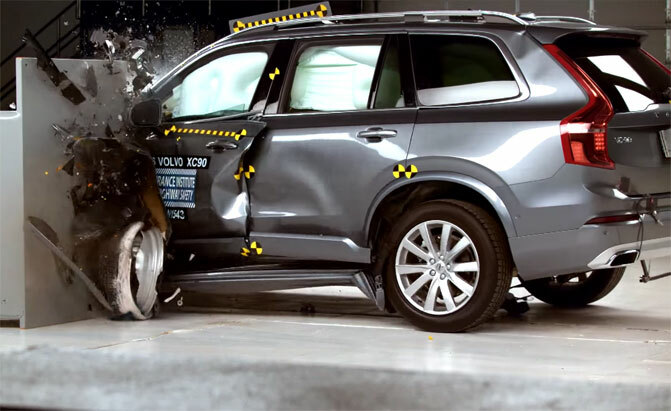 The XC90 received a full score in all tests (crashworthiness and front crash prevention), excelling in both preventive and protective safety performance. The XC90 also scored top marks in recent Euro NCAP testing – further proof that XC90 is one of the safest cars on the roads today. "The independent testing result from IIHS once again highlights the exceptional nature of the work we do at Volvo Cars in taking car safety to a new level. Our combination of an ultra-high-strength steel safety cage with a patented front structure, advanced restraints and our standard auto braking system, City Safety, combine to deliver unparalleled performance," said Cecilia Larsson, Director of Volvo Cars Safety Centre in Gothenburg. The IIHS crashworthiness category includes tests covering small overlap, moderate overlap, side, roof strength, head restraints and seats. Volvo achieved top scores in all of these tests and was deemed superior in front crash prevention thanks to the standard City Safety technology that is fitted in all new Volvo cars. The superior rating for front crash protection makes the XC90 one of the first cars with standard equipment to receive a 2015 Top Safety Pick+ award.